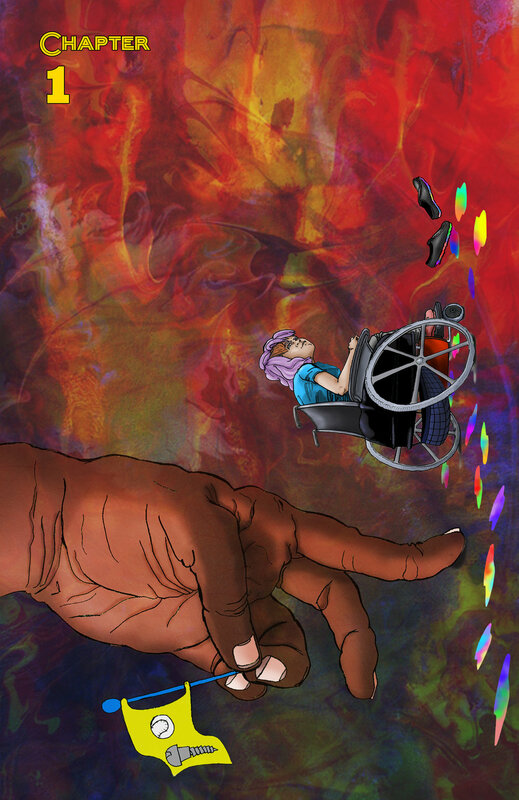 A contemporary fairytale about the surreal adventures of Remi Ream, a paraplegic girl who works with parallel universe versions of herself in comic book worlds and uses these three books that give her powers over art and storytelling. The Complete volume 1, compiling the first 4 issues, is available in print through here. The Unfinished Drawing is an interactive coloring/drawering book about an incomplete Drawing found by a Narrator who takes it upon their self to help the Drawing finish itself. The problem is that the Drawing doesn't like any of the changes made to it. The beginning of the story it a little weird. Remi Ream thought that she was gonna have another typical school day, that is until she enters her imagination and encounters a transparent, rainbow-pantsed man named ________ ________ who is literally a walking idea. Another Remi joins a demon cop named The Ghost Writer on a journey through Hell. Together, they go through a hilarious, transformative journey experiencing the joys of life, death, and the afterlife. Continuing where we left off of Chapter 1, Remi and ________ ________ finally run into ________ ________'s illusive Body, only to discover that he has a bone to pick with The Blankster. Between zip-lining hammocks, Giant Hand Monsters, a posse of Talking Robots, and a showdown inside an art gallery, this insane world has become too much for this Remi to handle. Another Remi Ream is stuck between a rock and a hard place. Her companion Stanton, a blue ogre with a cyborg arm, has been shot. They are stranded in the middle of nowhere with nothing in sight. How can she help him? She relies upon the help of a duck and a rabbit to save her friend. Continuing where Chapter 3 left off, ________ ________'s Body has been teleported into a strange and peculiar universe. Ours. He has befriendedLanding in the Dominican Republic, he has befriended a boy named Remi. Body tries to find a job as a superhero in this brutal world. Volume 1 of The Wonderful Wheels compiles the first 4 chapters. 100 pages. The Unfinished Drawing is an interactive coloring book. 20 pages.